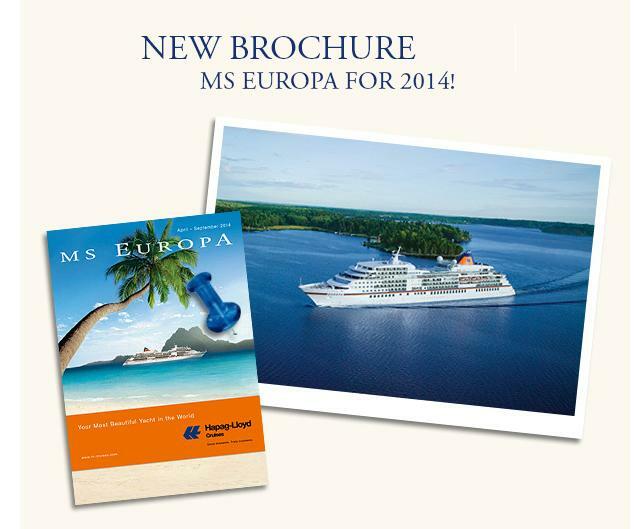 Hapag-Lloyd Cruises proudly presents its new brochure for MS Europa cruises between April and September 2014! The first section, detailing the ship, now shows in more detail everything interesting about The World´s Most Beautiful Yacht. Especially for the suites more space has been devoted to outlining their stylish interiors. In 2014 there will be four cruises which will be offered internationally in English and German, ensuring that English-speaking passengers feel comfortable from the moment they board. EUR 1408: Limassol to Venice, 12 days April 29 – May 11, 2014. One of the highlights is the international classic singing competition Stella Maris! EUR 1410: Barcelona to Lisbon, 16 days May 25-June 10, 2014. On this cruise the 14th MS Europa Golf Cup will take place. EUR 1411: Lisbon to Hamburg, 14 days June 10-24, 2014. The Event “Europas Best” will transform the Lido Deck into a gourmet paradise with Europe´s most famous chefs, winemakers, affineurs, fromageurs, patissiers and chocolatiers. EUR 1419: Travemünde to Hamburg, 13 days August 31-September 13, 2014. Leading classical musicians come together on the Europa: the Ocean Sun Festival celebrates classical music every year out on the open sea. The best chamber music performers, famous opera singers, virtuoso musicians and well-known conductors create a unique mix of music and the sea, giving one the unparalleled pleasure of experiencing world-class stars up close and personal in the intimate surroundings of Europa. 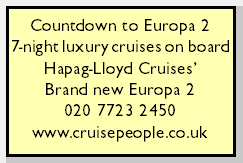 For further details of Hapag-Lloyd Cruises or any Europa or Europa 2 cruise please call Gay Scruton at The Cruise People Ltd in London on 020 7723 2450 or e-mail cruise@cruisepeople.co.uk.